San Jose Serviced Apartments: Europeans, Move Now Before It’s Too Late! With California on the rise, San Jose, California, accommodations are only going to experience price increases, and drops in availability. With California’s new found stability there will be an influx of people and if you don’t play your cards right you could lose out on the best deals. Make sure to think ahead and book your San Jose serviced apartments. While Americans call these “Furnished Apartments,” it’s more common among Europeans to call them San Jose Serviced Apartments. In any case, they represent apartments that are fully furnished and ready for a short-term corporate rental. The cost and the availability of accommodations in California especially in the San Francisco Bay Area and Silicon Valley, will continue to create challenges for anyone traveling there in 2015. Europeans, in particular, have a new worry: the falling euro versus the dollar. With all of the economic malaise in Europe, unfortunately, their currency is beginning to depreciate vis-à-vis the dollar. This, in conjunction with a red-hot economy in the South Bay area, means that prices are going up rapidly even for Americans who earn and pay with dollars, and even more so for Europeans who must exchange their euros four dollars. So, one reason, to act fast if you are European looking for a service department in California, is the fact that for now at least, the euro is depreciating against the dollar. Another reason is that it is nearly spring in California, and the state always has a huge influx of tourists, as well as the typical business travelers to Silicon Valley. With the rise of the Internet, more and more tourists are looking for short-term rentals, and this is yet another factor pushing the price of serviced apartments up. Anything that is near a tourist destination in California is subject to yet even more rapid price rises. The good news, however, is that we at Key Housing actually live in California, and we are experts at the California housing market. Our expert consultants scour the state and form relationships with top apartment complexes so that we can offer the best selection of serviced apartments, whether that is in San Jose, Sunnyvale, Mountain View, were other destinations that make up Silicon Valley. In your downtime there are plenty of fun things to do in San Jose including visiting the Tech Museum of Innovation or Rosicrucian Egyptian Museum. Or if you’re ready to get started you can browse all of our San Jose serviced apartment opportunities. Among our properties, take a look at this one: the Fountains at River Oaks. 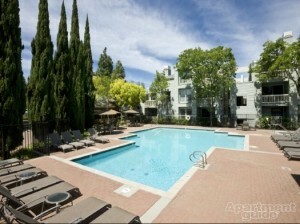 Surrounded by lush grounds, these San Jose apartment homes are spacious and newly remodeled. Community Amenities: include: Barbecue and picnic area, Business center, Pool with expansive sundeck, Reserved garage parking with remote. And it’s a Smoke-free community. This type of serviced apartment is hard to find, unless you have a “friend in the business,” which would be Key Housing. This entry was posted in Furnished Apartments and tagged San Jose on February 28, 2015 by Lee McDonald.